I suppose most of us would not have given much thought as to what kind of desk lamps we use – as long as it provides an adequate amount of light, it ought to be good enough. Having said that, if you were to sit for long hours at a stretch in front of a desk, then it would pay dividends to invest in a decent lighting system so that your eyes would not feel so tired at the end of a particularly long day. 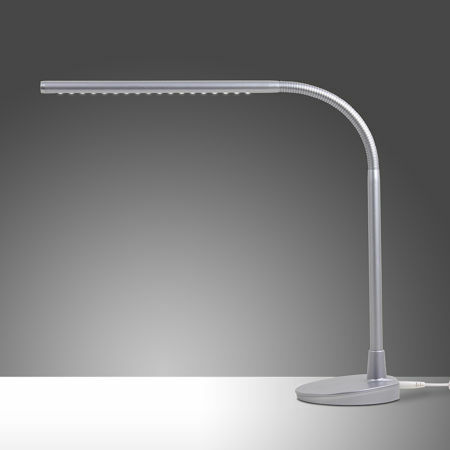 Satechi, more often than not rolling out smaller peripherals, is back with something that not many people might consider, although it is essential for the office drone – the Satechi Flexible LED Desk Lamp. This Flexible LED Desk Lamp will boast of versatile functions that make it a necessary companion and accessory for any home or office space. Sporting a sleek design, this particular silver lamp would also feature an adjustable neck and has been specially programmed to feature five different brightness levels so that users ought to be able to find a brightness level that is suitable for work as well as studying sessions. Heck, I suppose if you are going to assemble a model with glue, then the Flexible LED Desk Lamp would also come in handy so that you won’t lose track of all the small bits and pieces. The Flexible LED Lamp will come with a USB port to keep up with the times, and this USB port is located right at the back of the lamp. The reason for being there? It doubles up as a charging port for any of your power hungry devices, be it smartphones or GPS navigation units, or digital cameras. Heck, the USB port will charge up any thirsty batteries even when the lamp is turned off, now how about that? This environmentally-friendly lamp consumes a mere 8 watts of power and will retail for $59.99 a pop. Cool design. However, I only see it available in silver which clashes with many of the things I have at home. How does this lamp compare with the Lightline 1250 by Lumiy which has tons of colors and is better priced?